Two chilling ghost stories from the author of The Woman in Black, both set in crumbling English houses that are haunted by the spirits of thwarted children. A VINTAGE TRADE PAPER ORIGINAL. In The Small Hand, antiquarian bookseller Adam Snow is returning from a client visit when he takes a wrong turn and stumbles across a derelict Edwardian house with a lush, overgrown garden. Approaching the door, he is startled to feel the unmistakable sensation of a small cold hand creeping into his own, almost as though a child had taken hold of it. Plagued by nightmares, he returns with the intention of figuring out its mysteries, only to be troubled by further, increasingly sinister visits. In Dolly, orphan Edward Cayley is sent to spend the summer with his forbidding Aunt Kestrel at Iyot House, her decaying home in the damp, lonely fens. With him is his spoiled, spiteful cousin, Leonora. And when Leonora’s birthday wish for a beautiful doll is denied, she unleashes a furious rage which will haunt Edward for years afterward. Why did we read this book: Ever since Thea discovered Susan Hill’s The Woman In Black (and made Ana read the book, too), we’ve been fans. When we were approached with a review opportunity for this book, a bind-up of two of Hill’s previously published novels, we were thrilled (and, quite sanely, a bit terrified). Adam Snow is an antiquarian book dealer who is driving back from a visit to a client when he gets lost on the road and stumbles across an old Edwardian mansion, locally known as The White House. Hoping to find help, he walks over but the house is derelict, empty. Still, overcome with a strange sense of curiosity he lingers and it is then that a small hand creeps into his own, resting there like that of a child holding his father’s hand. But Adam is not a father and the hand is invisible. At first, he feels that encounter to be a benign one but in the ensuing weeks further encounters with the small hand grow increasingly malign. Adam wonders if he is being haunted or is he growing mad, the memory his brother’s mental breakdown a few years back still vivid in his mind. Plagued by nightmares and a sense of a malevolent presence, he is driven to investigate the history of The White House. The Small Hand is a creepy, atmospheric ghost story that is both utterly familiar and terrifying; the latter made possible exactly because of the former. The elements of familiarity are there for the taking: a derelict house, a sense of atmosphere created by the presence of old books, old stories and a build-up of tension that relies a lot on foreshadowing. In this case familiarity works and those elements are woven expertly in the story to exploit our sense of “we know what is happening” and to lure the reader into a sense of false safety that is overturned by the time the ending comes. The story reads like a very old-fashioned, timeless tale and certain elements like the old house, the old books, and the main character’s profession are almost enough to make me us forget that this is a modern, contemporary setting. It is a very impacting, effectively scary story but one that is also strangely cold: Adam’s narrative is strangely disconnected and distanced and any sense of horror he might have felt don’t seep into the narrative. Again, this brings me back to the effect that “familiarity” has in stories like this: I wasn’t scared because Adam was. I was scared because I understood, based on previous experience, what was happening. Perhaps his coldness when recounting these events are part of makes this book a successful ghost story – at least for me? The Small Hand is only the second story I’ve read from Susan Hill, and, I think this colors my expectation of her books and her writing. Both books are narrated in the first person, both books rely very heavily on a traditional atmospheric mounting-tension type of horror, and both books have abrupt, terrifying – simultaneously shocking and inevitable – ends. But I am getting ahead of myself. First and foremost, The Small Hand is a proper ghost story (in fact, it combines two classic tropes: the vengeful ghost, and the terrifying child). It’s a story about an introverted antique book procurer named Adam, who mistakenly stumbles upon a derelict house and a malevolent ghost – Adam fears that he is losing his grip on sanity, as the small ghostly hand of an invisible child increases its hold on Adam. It’s also a story about loss, and memory, and – most chilling of all – secrets long buried. Stylistically, The Small Hand is an effective, chilling little book. Who would not be scared of feeling a cold little ghost hand slip into one’s own, pulling one towards a watery grave? Who would not wake in terror in the night at the prospect of such a persistent, senseless terror? Susan Hill is the master of this brand of creeping atmosphere, of spinning dread and tension and fear into a web of claustrophobic terror. What’s so effective about The Small Hand (and, to a greater extent The Woman in Black) is how quiet this tension is. How unobtrusive, how banal. Gradually and with great skill, the history of the White House, the mystery of the small hand’s owner, and the unique ties this story has to the narrator’s childhood are beautifully and effectively revealed over the course of this short novel. It’s with the deepest dread that I turned the last page of this story because, instinctively, I knew that something so awful would be waiting there, some dreadful revelation that would explain the small hand’s singular purpose. And while that revelation is predictable, it is incredibly horrific and effective. (Even if you know the scare is coming around that corner, it doesn’t stop the scare from being scary.) That is the mark of a great storyteller – a great horror storyteller, to boot. Edward Carey is back to Iyot House, years after the summer he spent there as a child in the company of his Aunt Kestrel and cousin Leonora. He has vague memories of what happened there that one summer and it’s the sound of shuffling and muffled crying that jogs his memories and makes him remember. He remembers that summer years ago when he was a quiet, orphaned boy sent away to Aunt Kestrel’s house. He remembers meeting the spoiled, spiteful Leonora. He remembers her birthday wish for a beautiful doll and her reaction when she didn’t get what she wanted. Is it possible that they are all still living the repercussions of that one summer wish? It is interesting how Dolly follows a similar pattern to that in The Small Hand with lots of familiar elements, tons of foreshadowing and the unspoken presence of a mysterious evil but in this case where was something about it that didn’t quite make it work as well. Perhaps it is the reek of misogyny that runs through the underbelly of this story. Edward’s narration leads the story on for most part, apart from a few scenes from Aunt’s Kestrel’s viewpoint which adds a lot of backstory about her two sisters, Leonora’s and Edward’s mothers. The depiction of Leonora as well as her mother underscore a lot of the “evil” in this story. Edward is portrayed as a meek, sensitive child whose mother was the ugly one in the family. She dies when he was really small then he is brought up by a distant relative. Everybody just “knows” he is going to do just fine in his life. Leonora, on the other hand, is depicted as a spiteful, spoiled, loud and beautiful girl who everybody just “knows” will grow up to be just like her spoiled, loud, beautiful mother and to have multiple husbands and lovers. Both Leonora and her mother’s malevolence are connected to how they look. It’s a recurring theme and Leonora’s childish tantrum when she is nine is believed to be the source of characters’ problems in the future. I’d love to think that the story is actually doing something interesting with the discussion of nature vs nurture and with the way that we perceive strong, independent women. And how Leonora’s behaviour could be directly linked to how she is brought up and how people’s perception of female beauty as a source of evil can effectively ruin lives. But in my opinion, this is giving the book too much credit: because both Edward and Leonora are loveless children who are brought up by dysfunctional families and yet only Leonora and her mother grow up to be spoiled shrews who are hated by everybody. Although the ending somewhat dispels the idea that it is Leonora’s fault, it is indeed still hinted that she got what she deserved. Dolly is a puzzling story about evil and I am still trying to understand what it is that it was trying to do as it attempted to – unsuccessfully – scare me. OH I LOVE IT when Ana and I disagree. While I completely respect and understand where Ana’s interpretation of Dolly is coming from, I respectfully disagree. It is worth noting that Dolly is narrated entirely by Edward – whom Ana aptly characterizes as a meek boy and mild-mannered man. It is true that Edward is portrayed as a quiet but sensitive boy, who found happiness in Iyot House, who is attentive and thoughtful and whom all the other adult characters think of as a boy that will do just fine in life. This is true. What is also true is that Leonora is beautiful, and seen as a spoiled, entitled, even cruel young child, prone to fits and terrors and rages. She grows into a spoiled, entitled and cruel but beatiful woman, who is still prone to fits and terrors and rages. It is also true that the book and all of these interpretations of characters, are related by Edward in the retrospective. Edward is the one who sees Leonora as a spoiled, beautiful, cruel brat and jaded woman; Edward sees himself as being mild and meek but positively thought of by others. In my reading of the book, Edward is a little bit spiteful, perhaps even attracted to Leonora, whom he paints in a beastly way because of his own hurt feelings. I do not doubt that Leonora is entitled and even spoiled, but I think everything Edward says needs to be taken with a grain of salt – Leonora’s actions at the end of the book, in particular her care of her daughter, speak to a very different character than the heartless, selfish beast Edward describes. And then there’s the matter of the dolly in the title, and the curse that seems to sit on both children. See, Leonora isn’t the only one “punished” or touched by evil in this book. Edward suffers this, too. I think there’s a greater evil at work in this particular novel; something more sinister attached to both of these children who grew into adults, who have children of their own. To me, this is the shortcoming of Dolly – that this evil, insidious something is not fully formed or even tangentially explained. 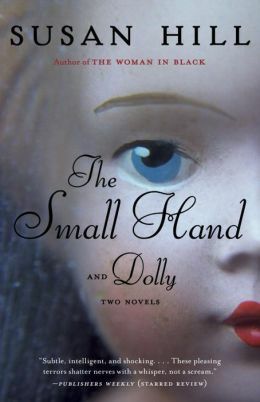 Perhaps this is the best way to put my experience reading The Small Hand and Dolly: of the two, The Small Hand is the more refined tale, but I relished in the horror and nastiness that is Dolly. Ana: 3 – Bad. Skip it. I’ve read The Small Hand and enjoyed the creepiness of the central idea although I found it not quite scary enough for me… I had just read Dark Matter on your recommendation and was longing for something to match the fear factor of that – a hard act to follow! Now I feel I have to read Dolly just I can see who I agree with! I just don’t understand why Edward’s doll changed..